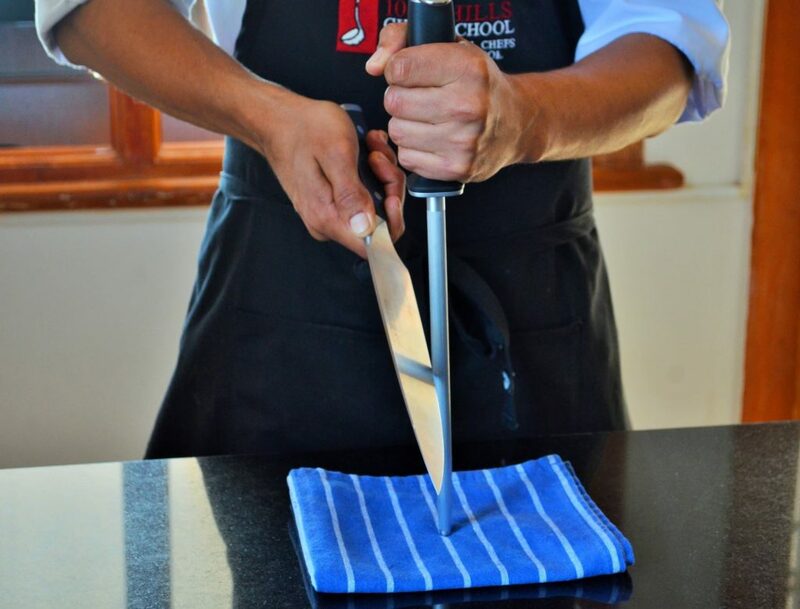 • Store your knives correctly, separated from each other and away from other metals. A knife roll or knife block is a good option. • Always cut on the correct surface. A polyurethane cutting board is best to keep your knives in a good condition. Wood, granite and steel tops will blunt your knife. • Hone your knife every time you use it. You may sometimes need to hone the edge during use; e.g. when preparing fish. 2 Holding the knife in your dominant hand, take the heel of the blade (the part closest to the handle) and place at a 45 ̊ angle to the steel. 3 In a smooth, sweeping motion, swipe the edge of the blade from heel to tip down the steel, towards the counter. Repeat with the opposite side of the blade on the other side of the steel. Repeat steps about 5 times for each side of the blade. Every few months you may need to sharpen your knife. You can do this on a wet stone.